Apart from the full stop and comma there are a few other English grammar rules and punctuation marks you should learn. There are not many of them and it won't take you long. Once you get into the habit of using them it will show to people who read your work that you have a good understanding of punctuation and English grammar. The apostrophe looks like a comma but it is placed at the top of a word not the bottom. For example: This is John’s house. 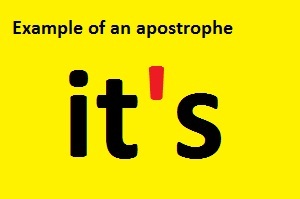 There are a number of English grammar rules that apply to the apostrophe. However many people are not aware of all of them. When something belongs to someone such as john’s car or Amy’s piano these are their possessions. To show that you are talking about a person’s possession you need to put an apostrophe before the ‘s. If however you are writing about something that is possessive and plural the apostrophe goes after the s’. This now means that two or more bakers (plural) own a shop together (possessive). With some words you can use the apostrophe to show that one or two letters have been removed. This is used when something belongs to a thing (possession). The castle is famous for its tall towers. 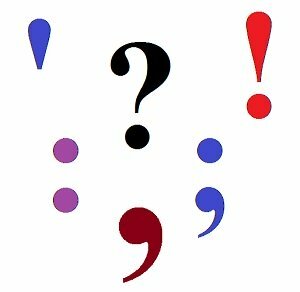 It's easy to use these two little punctuation marks to help make your writing more refined. The easiest way to use a colon in a sentence is to replace the word because. 'Katie went to the shops to buy some apples because she wants to have a healthier lifestyle'. 'Katie went to the shops to buy some apples: she wants to have a healthier lifestyle'. 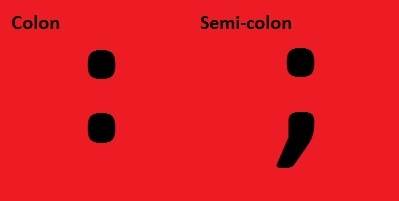 When you have two sentences that are very closely related to each other you can use the semi-colon to join them together. 'The night was cold and unpleasant. It did not get much warmer when the sun came up'. You can use the semi-colon to show that these two thoughts are linked together. 'The night was cold and unpleasant; it did not get much warmer when the sun came up'. It's fine to use either the full stop or the semi-colon between these two thoughts. By using the semi-colon you are showing that the two sentences are closely related. Knowing where full stops go is more important than the English grammar rules above. Nevertheless learning and applying them will improve the quality of your written work. This will help you impress teachers and employers. Return from Lesser Known English Grammar Rules to Home Page.